A magic city on the water…Venice, the dream of many artists and magnificent “signori”, an open-air museum that always stir up emotions! It is the favourite travel for all times and from all the world! Are you ready to go in this end of Summer to Veneto? If so, you can’t miss two fantastic events that are staged in September in one that without any doubts is one of the most beautiful city in the world!!! 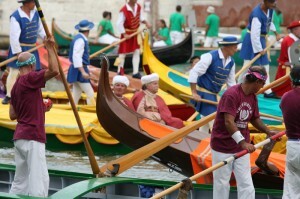 First, come and check out the “Regata Storica” (historical Regatta) in Venice! It is an historic boat race, taking place the first Sunday in September with four race categories (for children, for women, for men in 6 oar boats, and the championship racing in boats with 2 oars). The champions regatta is called “gondolini”, the men regatta “caorline”, the women’s regatta “mascarete”, the young rowers’ regatta “pupparini”. Why? The reason is very easy to understand, once you get used to Venetian dialect: it is because they use various types of boats in the Regata Storica: respectively, the “gondolino”, the “caorlina”, the “mascareta”, the “pupparin”, and, of course, the gondola, the world-famous Venetian boat. The earliest historical evidence of rowing races? Very ancient! It dates back to the second half of the 13th Century, exactly in 1274, and as in the ancient time it will start starts at Castello. You will experience the joy, the history, the colours and the sounds of a traditional but much alive events that has Venice as gorgeous frame!!! The races will be opened by a glamouros parade. In this spectacular procession you will admire splendid, elaborately carved boats with hundreds figures dressed up in gorgeous brocade costumes. And if you enjoed this Regata, just stay over till the third weekend of September and you will love also Burano Regatta, that is similar to Venice’s historic Regata, but it takes place off the island of Burano, close to Venice. This entry was posted on Wednesday, August 3rd, 2011 at 4:09 pm	and is filed under Events in Italy. You can follow any responses to this entry through the RSS 2.0 feed. You can leave a response, or trackback from your own site.